I was supposed to understand. A great storm brought New Orleans back to the writer, who has lived for many years in Europe. Brought him back, but did not keep him. For there are many layers to explore in this world. Gordon Walmsley grew up in New Orleans. He is a graduate of Princeton University, where he studied German and Philosophy. For the past number of years he has lived in Europe. Copenhagen, Berlin and the Nordic countries are places he feels drawn to. His poetry takes different forms. “Really, I have a three-fold project,” he says. “The first is to penetrate the layers of this world, the second is to return to the well, and the third is to open myself to surprise.” In addition to writing poetry he has translated poets from Sweden, Norway, Denmark and Germany. He edits www.copenhagenreview.com. 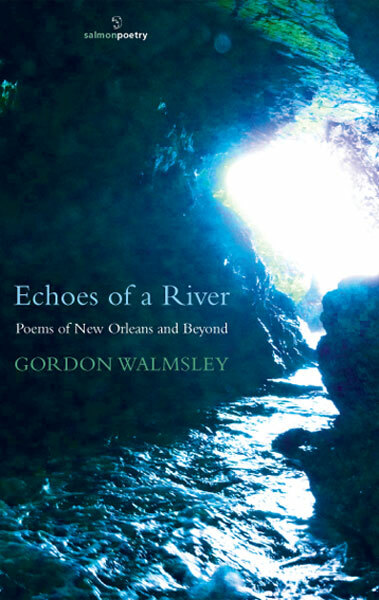 THE NATURAL ENVIRONMENT and questions of identity ... feature in Gordon Walmsley’s Echoes of a River: Poems of New Orleans and Beyond. Walmsley, originally from New Orleans, revisits his birthplace after Hurricane Katrina to search for meaning amid the senseless devastation of the storm. In some poems the city and its waters are personified as the "yawning Louisiana girl" or "the beast sleeping heavily below", to drive home a sense of spiritualised interpretation of loss. ... Walmsley['s] "spirit of compassion and empathy" shines through the pages. The shorter echo poems that are placed like waves in the volume lend a visual interpretative layer that helps the collection in imparting more complex readings ("something can arise / from a wave that falls / among the sounding words"). us start with the making of a map. movement, panning a world we begin to see.